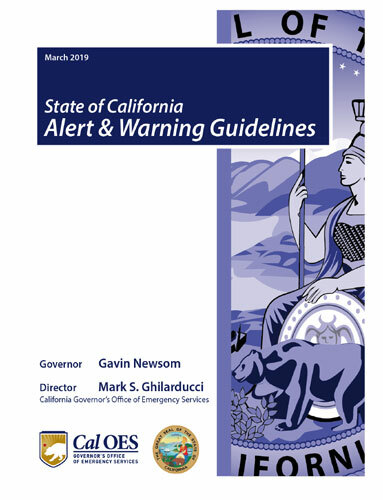 Pursuant to Government Code Section 8593.7 (via SB 833, McGuire- 2018), the first-edition of California’s Statewide Alert and Warning Guidelines is being presented. These guidelines represents the collaborative effort of a Standardized Emergency Management System (SEMS) specialist committee working to establish statewide guidelines for the purpose of enabling and encouraging consistent application of alert and warning best practices, procedures, and protocols. Recent disasters in California have highlighted troubling shortfalls, differences and inconsistencies among various alert and warning programs. As a result, many public safety and community leaders have expressed the need for more awareness of emerging systems and technologies used throughout the state and nation, and work towards an improved and more standardized approach. These guidelines are intended to help with the implementation, and enhancement, of local comprehensive alert and warning programs. Additionally, it provides overarching direction to the sub-components of the statewide alert and warning system, including the State Emergency Alert System (EAS) Plan, sub-jurisdictional alert and warning programs, and local EAS and alert and warning plans. Please note that these guidelines are a “living document” and will continue to evolve and be revised as appropriate given changes in processes, technologies and other related factors.